Teaching Company items now shelved together! One of our library’s goals is to promote lifelong learning. One way for patrons to explore new topics guided by respected teachers is to borrow items from our Teaching Company collection. In the past patrons would need to look in various places to find the collection. Now, all Teaching Company materials are shelved together for easy browsing. You can find the collection in Row 11 of the AV Annex on the ground floor. In case you haven’t heard of the Teaching Company, it’s a publisher of courses with the world’s most engaging professors and their profound insights. You can learn from these professors’ audio or video courses where you want to, when you want to, and how you want to. The extensive collection contains more than 390 Great Courses in diverse subjects and fields including history, science, philosophy, mathematics, literature, economics, and the arts. Just a reminder to all of our patrons to vote in today’s special primary election. Today, voters will choose candidates to run for a U.S. Senate Seat in the June 25 special general election. Here are some of the facts. Don’t know your ward and precinct? Type in your address on the Secretary of the Commonwealth website to get information about your precinct and polling place. If you are not registered to vote, it is too late to register for today’s election. If you are not registered and want to be eligible to vote in the June 25 election, you must register by June 5. Register to Vote at your town or city clerk’s office. The Waltham City Clerk is located on the second floor of City Hall at 610 Main Street. They are open Monday – Friday, 8:30 am – 4:30 pm. Pick up a mail-in voter registration form at the reference desk at our library. Register to Vote at the Massachusetts Registry of Motor Vehicles when renewing your driver’s license. Download a mail-in voter registration form from the Secretary of the Commonwealth website. You can download a form in English, Spanish (Español), or Chinese (中国的). Looking to try out digital books? eBooks and eAudiobooks are super versatile and completely portable. Check out a few of these guides for getting started! Our thoughts at the Waltham Public Library are with all of those who were affected by the attack in Copley Square, yesterday. For those of you who need some help or who would like to lend a hand, here is some useful information for you. MBTA: The green line is up and running, though Copley Square is still closed. There may be other disruptions, so please continue to monitor the MBTA site or call 617-222-3200. Riders should expect to go through security. 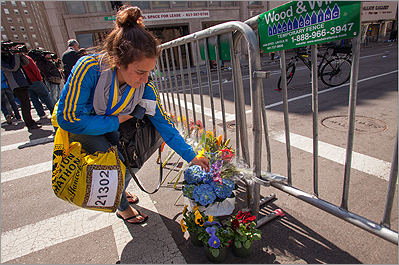 Call the Boston Police Help Line at 617-635-4500 to get information about a loved one. Check for your loved one at the American Red Cross “Safe and Well” site. Likewise, if you know people are looking for you, please register yourself at that site. You can track runners at the Boston Marathon page. The Salem Waterfront Hotel in Salem, Massachusetts is offering free housing to marathon runners as long as they show their bib numbers. Donating Blood: The American Red Cross and area hospitals have said that they have enough blood for this particular tragedy, however there is always a need for blood donations. Donate to one of the charities highlighted by several of the marathon runners. Avoid Charity Scams: Sadly, there are always charity scams during events like this. Read the attached article on how to avoid them here. A scam for this particular incident has involved a fake Twitter account, @_BostonMarathon (note the underscore) claiming that it will donate money for every retweet. The Massachusetts Department of Revenue (state income taxes) has announced on its website that taxpayers who live in the Boston area or who have been personally affected by the attack have their filing deadline extended until April 23. Call 617-887-MDOR to find out if you are eligible.